Yesterday saw the touring party leaving for India & it seems that the controversy has begun already on three separate fronts. Firstly we have already had the protracted 'will they, wont they?' until it was finally announced that a certain KP would be admitted back into the squad ( though whether he has been accepted back is another matter). There are also no signs yet of a big group hug and the rumours that he's been made to travel in the hold with the rest of the luggage has yet to have been confirmed. This is the first time a cricket board has ever asked for money to provide commentary positions and both Sky and the BBC feel the rights fees covered the provision of full facilities. There is the real possibility that any TV or radio coverage is actually the result of independent commentary from television pictures off a television set in London rather than live action at the venue. Of course I couldn't possibly comment on the suggestion from some that streaming the coverage from unofficial internist sources would be out option if this happens. For a start, the Indian coverage seems to break the record for partisan commentary ( DRS, they argue, is the work of the Beelzebub) and also commercials every 2.3 seconds..er, apparently. The third element of controversy emerged also this week with the announcement of the Mumbai team for the first warm-up game next week. A few raised eyebrows were raised when it emerged that the Mumbai side would contain no spinners at all. Mr Bumble soon added his admonishment of the home side ( “No spinner in India A team vs England….totally lacking in class and style decision,”) . In essence, the suggestion that this was brinkmanship of the highest order against a touring side who are notoriously suspect against spin bowling. Is this a serious precedent? Well traditionally the home series board have for example prepared pitches that would favour the home side. Who can forget the naughty West Indies in the 1970's & 80's preparing pitches that were, well, quite fast for their quite fast bowlers? The cheek of it. Completely different from our recent preparation of pitches that could help Mr Swann's spin bowling of course…..
At the risk of sounding again like I'm India-bashing (which I'm not) this could be slightly different though. There was a time in the not too distant past when the warm up matches were a place to get 1st teamers fit, introduce some exciting new talent and basically try to give the touring party a real old fright before the real action began. Ahh, those days when England would get walloped by a Presidents XI in the Caribbean even before Messrs Ambrose and Walsh had had a chance to make us bleed. Now however, the precedent has been set. The Indian selectors’ move to go ahead with an all pace attack for the 3-5 November duel is reportedly been intended to not provide the visitors with any chance of getting a feel of India’s strength. What happens here next year when the Aussies come to town? At the risk of causing some of the MCC members at Lords to choke on their early morning crumpets, I wanted to make the very first entry of the blog about Greigy. It has been well publicised recently Tony Greig has been diagnosed with a form of lung cancer, the extent of which we'll know of soon. The era of the early to late 1970's were when Cricket imprinted itself on my psyche, my formative learning experience where the likes of Knott, Underwood, Boycott, Close and Greig became my first Cricketing heroes. Yes the tv coverage was limited and often patchy from the BBC - I'll never quite forgive the old beeb for constantly shifting from between the Headingly 1981 test match ( yes, THAT one) and the British golf open. But the commentary was always spot on and informative without ever becoming patronising or preaching( take note Sky pundits) . As for the Test match special commentary, Messrs Johnson and Arlott were my radio gods. So it was the best of times, it was the worst of times (thanks to Mr Dickens for that one). Perhaps this is why I think it's time for a re-appraisal of Tony's england career. For me, it's always seemed a shame that the many controversies on the pitch ( e.g the Kalicharan run out - which he was perfectly entitled to do - and the 'we'll make them grovel' prediction for the West Indies series) and off the pitch ( Packer et al, commentary for Aussie tv etc ) have tended to obscure and overshadow what a fine Cricketer Greig actually was. The losses as captain incurred at the hands of Australia ( Lillie & Thompson et al) and the matches against the ever stronger West Indies where his 'make them grovel' comment before the series started about this upcoming opponents typified his ability to talk himself into trouble. As it happens, fine attributes to go with a long career as a Cricket commentator. 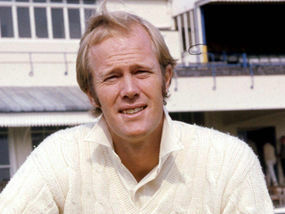 For me, its a crying shame that Tony Greig is remembered solely in some circles as the captain who led cricket into its biggest crisis of the last century. He lost the captaincy in the most controversial of circumstances when it became clear that he was actively recruiting players for Kerry Packer's World Series Cricket. More than thirty years later, he's perhaps more recognised commentator for Australian television where controversy has still accompanied him ( The "I wonder if she's a mail-order bride" episode, to name but one). Greig has never been fully forgiven for his part in a series of events which almost tore world cricket apart. His ability to court controversy remains undiminished. Take for example his much publicised Cowdry lecture where spoke passionately as to the state of the sport and issues facing the game in general. In the process ruffling some Indian feathers when stating that many of world cricket's problems come with the effective power of veto that India holds over the ICC. Now I love Indian cricket, Sunil Gavaskar and Kapel Dev are two of my cricketing heroes. However I believe that the IPL and other 20/20 competitions around the world may be the work of the cricketing devil in killing off the Test match format. That, combined with the BCCI's constant refusal to hold the ICC to ransom over such issues as DRS led to a a polarisation of reaction to his comments. What cannot, and should not be denied, is that he was a great all-rounder who combined, aggression, boldness with stubbornness. Ironically, the very attributes that endeared him for more to the Australian authorities and public then ever to England. He was the first South African to skipper England, re-establishing an element of national pride with emphatic victory in a tough tour of India after the slaughter at the hands of Australia and the West Indies. Sadly he remains largely unforgiven, his career to be forever under-appreciated. Get well soon Tony. Make that Cancer grovel. Highlights of Tony Greig's innings which rescued England from 43-4 in the 1975 Ashes game at Lords.